Not to be completely overshadowed by China’s half-billion-dollar Bird’s Nest stadium and stunning Water Cube aquatics facility in Beijing, the North American ski company Interwest announced plans last week for an Olympic-sized engineering project at its Whistler-Blackcomb resort, two hours north of 2010 Winter Games host Vancouver. 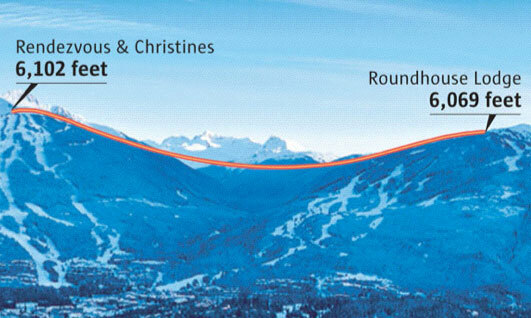 The $50-million Peak-to-Peak gondola will link the tops of Whistler and Blackcomb mountains over a distance of 14,436 feet (2.7 miles), with a maximum height above the ground of 1,362 feet—the world's longest and highest unsupported span for a gondola, according to Interwest. That's also nearly twice the length and height of the Golden Gate Bridge, though the gondola will carry only 28 cars rather than six lanes of U.S. 101. "The rope-line calculation of a 3,000-meter span is not easy," says Peter Luger, the head of R&D at Austria's Doppelmayr Ropeway Systems. "Height, clearance, flex and engine power have to be figured very carefully before we can realize it." Wind is also an issue. A traditional gondola uses one cable, which both supports and transports the cars. Blowing gondola cabins are free to pivot around that single rope. But for a span of this distance, extra stability is key. "This project combines the advantages of a tramway system, which uses two cables," Luger says. The cars will still run in a continuous loop (tram cars go back and forth) on a track cable, detaching at the terminals on each end, but they will be pulled by a second hauling cable. "The system is very wind-stable—two tracks and a tow rope." it's a remarkable thing because some cars will still run in a continuous loop (tram cars go back and forth) on a track cable, detaching at the terminals on each end, but they will be pulled by a second hauling cable.